How do I make Coding Awbie character boxes? For a fun, creative activity with your children or students, open this PDF to see how you can make Coding Awbie character boxes! How do I fit the Coding Awbie pieces in the storage container? This picture shows how to fit the Coding Awbie pieces in the storage container. Can I revert to an older version of Coding Awbie? It is not possible to revert back to an older version of Coding Awbie, however, you can access and play old levels of the game using the gear icon at the top and selecting Settings -> Classic. The new Coding Awbie version has 56 new levels and 5 new worlds! We encourage you to play through all the new levels, starting from 1-1. These are brand new levels, with lots of new challenges to solve and secrets to find. In case you want to skip through the new levels, we've added the option "Unlock Tokens" to your account to help you get back to where you left off. You can see your Unlock Token counter in the bottom right of your map view. To use them, tap on a level, then tap on the Fast Forward button. Please note that levels 1-3 and 1-5 are not skippable, as they are important in presenting concepts introduced with our new update. What Coding game do I have? I can't tell from the packaging. If you have an original Coding Awbie game, the box does not say "Awbie" on the outside. It's more of a plain white box. Just know that this game is, in fact, Coding Awbie. How do I get the Osmo Friends coloring book? There's no limit to the number of times it can be printed! How do I get started with Osmo Coding Awbie? Please open the Coding Awbie game on your iPad and press the Play button on the main menu once the game loads. After the animated introduction, tap the screen, and you will be presented with hints (an animated hand showing which blocks to use). The first level provides animated hints for every action. Osmo Coding Awbie is played by placing blocks of code in a sequence on the table. Once you have assembled your program, you can run it by pressing the green Play Button. The Osmo system will have a hard time seeing your code if your hands are covering the blocks. Make sure your hands are out of the way before pressing the play button. Master the world of Awbie by putting together complex commands for Awbie to follow. The more strawberries eaten in a row, the bigger the reward and the faster Awbie runs! Collect your seeds to start and expand your farm! Repeat and Number blocks will guide Awbie onto a longer and more complex paths. Want to make Awbie do a particular move multiple times? Use the Number blocks. Look out for repeating patterns in the landscape, they are opportunities to use the Repeat block. The If Block will help Awbie stay out of trouble! By using the IF block, Awbie will go down a different branch if he runs into trouble. Also, please note that the latest Coding Awbie update includes a manual in-game. It can be accessed via the Settings menu, under Manual. It introduces all blocks, as well as concepts such as looping and conditionals. I'm having trouble getting past level 5 - what can I do? If level 5 of Coding Awbie version 1.4.6 has you stuck, please see attached Treasure Map for guidance and assistance! What is the Osmo Coding Awbie game? Osmo Coding Awbie is a coding product. It introduces the Osmo Coding Language. Coding Awbie uses hands-on physical blocks to control Awbie, a playful character who loves delicious strawberries. Each block is a coding command that directs Awbie on a wondrous tree-shaking, strawberry-munching adventure. Coding Awbie is the easiest way to learn the basics of programming. Where can I order Osmo Coding Awbie? Coding Awbie is available for purchase worldwide on our website: https://playosmo.com/en/shopping/. You can also buy Coding Awbie in select retail stores. Find Coding Awbie at a retailer near you: https://playosmo.com/en/retail/. How much does Osmo Coding Awbie cost? In the United States, Coding Awbie is $49. What ages is Osmo Coding Awbie designed for? 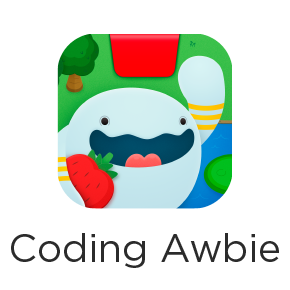 Coding Awbie is designed for kids aged 5-11. What is included in the Osmo Coding Awbie box? Coding Awbie uses hands-on physical magnetized blocks to control Awbie, a playful character who loves delicious strawberries. Each block is a coding command that directs Awbie on a wondrous tree-shaking, strawberry-munching adventure. What is the educational value of Osmo Coding Awbie? Through Coding Awbie you can learn how to effectively use sequential thinking, parameters, loops, and conditionals, all of which are essential coding skills. Coding Awbie has shown to be a great companion to excellent and free online resources such as Hour of Code and The Foos. In contrast to those products, we created a more continuous experience, where failure does not mean restarting the level, but instead just a less optimal outcome. This alongside a well-designed and scaffolded game results in an engaging programming adventure that requires little adult help. The tangible aspect of our game is also very engaging for kids, allowing for collaboration and hands-on play. Do you have instructions for Osmo Coding Awbie? Did you know that there is an in-app manual to help you get acquainted with Coding Awbie? It can be accessed via the Settings menu, under Manual. This guide introduces all the different blocks, as well as concepts such as looping and conditionals. Are there different levels in Osmo Coding Awbie? Yes, there are currently 24 levels, and we plan to release a new world later this year (2017). What is the purple star Magic Block in Osmo Coding Awbie? The Magic Block can currently be thought of as a drawing block. Using it will color the landscape around Awbie permanently. What is the Grey Caution Block in Osmo Coding Awbie? If any step of WALK RIGHT 5 will cause Awbie to make a mistake like running into a tree or jumping into water, Awbie will WALK UP THREE. Otherwise, Awbie will continue walking right. What do I do if I have completed all of the levels in Osmo Coding Awbie? While we do plan to release new levels in the future, we recommend replaying the levels again to strive for a higher personal best score. Have you explored all the Forest Levels past level 10? Have you planted and grown all the rainbow strawberry plants? Have you upgraded all Forest House items? Have you upgraded all the Beach House items? What is your highest strawberry score in each level? What is the most strawberries chained together? What if I lose the Play block? We're happy to send you replacement Coding Awbie blocks free of charge, within reason. select "Replacements" from the dropdown menu. We'll send you an email confirmation that we received your replacement game piece request and will also email you when the pieces have shipped. While you await the arrival of your replacement piece, you can change the settings in the Coding Awbie app itself to allow for a digital experience instead of a physical one. Go to Settings (a button in the top left corner of the screen) and toggle 'COMPILE BUTTON ENABLED' in the bottom left corner. You're all set to play the Coding game without the Play block! Enjoy! Why is the Osmo Coding Awbie Play button not working? If your hand is covering both of the slots in the top corners of the play button, Osmo will not be able to recognize it. The best way to help Osmo see it is to press with just one finger. Often, you might want to hold the play button with one hand and press with the other. This is fine, as long as 1 slot remains visible. The pieces are too close or too far away for Osmo to see. If this is the case, try sliding your pieces so that they are centered in front of the iPad. Are the play pieces centered in front of the iPad? They may be too close or too far away for Osmo to see. If this is the case, try sliding them closer to the iPad and making sure they are centered. Can I create my own puzzles in Osmo Coding Awbie? Currently there is no way to create custom puzzles in the Coding Awbie game. However, we're working on a bunch of free updates for the game that will challenge more advanced players and provide more content for all users. Are you planning any Osmo Coding Awbie updates for teachers? Yes, we are planning some Coding Awbie updates especially for teachers. We will soon push out an update with the option for teachers to unlock all levels. We also plan to release features that will allow teachers to set specific challenges per level. How do I get the Osmo Coding Awbie coloring book? After you purchase Coding Awbie, you are taken to an Order Confirmation page where you have the opportunity to share Osmo to your social network. If you do this, you will be able to get the coloring book as a download. How was Osmo Coding Awbie created? What do I do if Osmo Coding Awbie crashes? Any time an app crashes, it's good practice to close other open apps (double tap home button and swipe the windows up to close them). Also please try reinstalling the Coding Awbie app and restarting the iPad. If it doesn't help, please write us at support@playosmo.com with your iPad model number. You can find the model number printed on the back of your iPad.